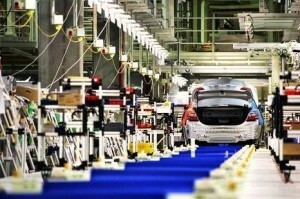 The automobile industry is one of the sectors which plays an important role on the world economy. The development of modern science and technology has helped enhance productivity, create high-quality vehicles to meet the needs of the people. But besides that, this sector has also negative effects on the environment and human health due to toxic substances emitted from the production process. In addition, automoblies also consumes a large amount of water. According to the estimates, each car consumes 40,000 gallons (182,000liters) to be produced. Therefore, the recovery and reuse of water from the waste water is the optimal solution to help reduce pollution and save water resources. Automobile manufacturing processes are often complex and spend several stages. There are many different manufacturing processes, but they all have in common that consume a lot of water. 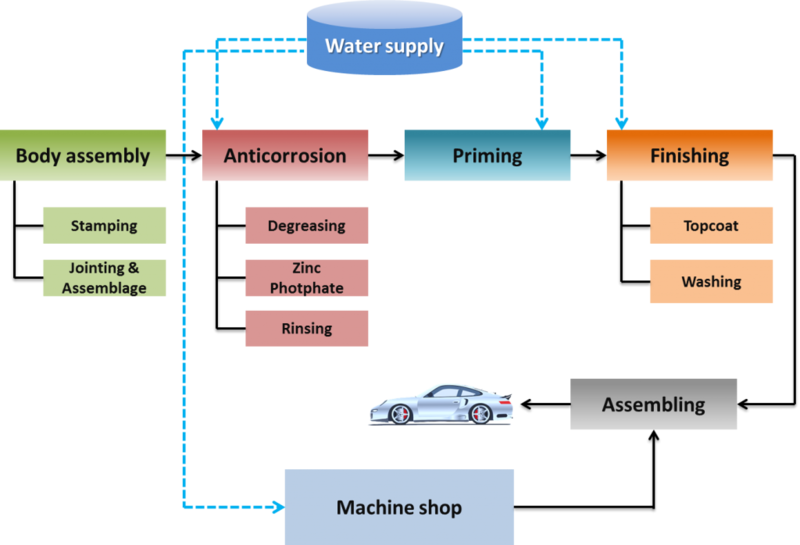 Moreover, the water supply for automobile manufacturing process requires high quality. Because water is used for mixing chemicals and cleaners should have to meet the standards set by the manufacturer, otherwise it may affect the quality of the product. Anti-corrosion: This stage consists of three steps, consumes about 60,000 liters of water. Degreasing: the whole chassis will be soaking in the tub containing detergent to remove oil, organic and inorganic compounds remain after stamping and jointing process, this is called alkaline wash. Water is used for mixing chemicals and rinsing. Zinc phosphate: chassis are sunk into the tub chemicals to coat a layer of zinc phosphate products. The chemical compositions are usually phosphoric acid, Ni2+, Zn+2 and water for mixing phosphate solution. Rinsing: this step helps to remove remain substances probably. Priming and topcoat: now the most car-makers are using water-based paints for less toxic and more environmentally friendly. The coating requires a relatively large amount of water to dilute depends on the amount of paint used. In addition, water is also used for making detergents and and cleaning spray equipments before changing new paint for cars. Finishing: chassis after topcoat will be washed again with water to remove excess paint and clean debris on the products. Machine shop: water is mainly used for mixing chemicals to clean grease on machinery. In addition, also need to mention water for domestic in factories. In short, the higher productivity is, the more water will be need. This does not only affect water resources but also creates a large amount of waste water, as for the processing becomes more difficult. 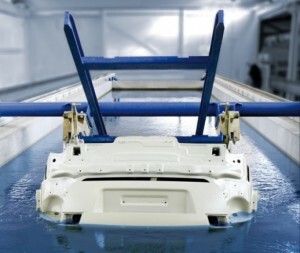 There are many ways to conserve water in the automobile manufacturing process in which the operator can reuse waste water from a number of stages, especially rinse stages. This solution not only saves water but also reduces the load of the wastewater treatment plant. Automobile producers can save 73 million gallons of water per year since install a reverse osmosis (RO) system. This system can help them not to discharge or cost to purchase water from the supply unit. The water used for the production car should be clean and deionized before going into the system in order not to influent the surface treatment. With this system, producers can recycle 90% of the water from the production process and ensure water quality inputs meet the standards set by the manufacturer. Easy to upgrade and expand the ability to recover water in the future.